The conversations with a friend of mine have gone on for a while as we both look to build video-editing PC's. We're not in the land-of-Mac, so don't even comment on that one. We've also been looking at realistic budgets. The premise remains that you are paying for a given amount of technology for a given price at any moment in time. There will be something faster and/or cheaper next month, if not next week. Make your choice. Live with it. But have some upgrade paths in mind at the outset. The thing we don't want to do is get seduced by the fastest gaming monster-box on sale. They don't necessarily make for the best edit-suites, with all that cooling and 3-D video game graphics rendering. These are all best-buy recommendations from various places either as good all-round performers or just much-bang-for-your-buck. Or in our case, GBP sterling (winces at exchange rate). I'm open to alternate suggestions and technical corrections. I've stuck wih the idea of setting a budget and sticking to it, getting as much techology for that amount of money, partly bcause I don't have any and partly to inject some realism into the exercise. Otherwise you just vanish into fantasy land; unless you're running a production company, that's difficult to justify. So I've avoided the top-end Quad and six-core processors as these effectively double the cost of CPU and the memory to go with it. They're fine if you want to spend £800-1000 on a box. I can't. The Intel i5-760 may not be cutting edge, but it is quad-core and on a reliable socket-1156 Lynnfield design. The socket-1155 Core i3 and i5 machines - 2300, 2400, 2500, 2600 - with (too-)new 'Sandybridge' design run the same kind of speed but there's a currently a product recall on the Intel 1155 motherboards for a SATA controller fault. My first choice of mainboard, an H67, is currently discontinued while they fix that one for re-issue. There is such a thing as too-cutting-edge. All the retail Intel chips come with a standard cooler which should be fine in a vented and fanned case as long as you're not going to over-clock. 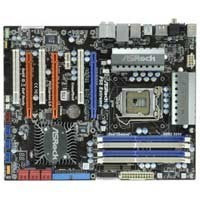 The Asrock P55 is a flexible mobo with scope for a lot of upgrades, hence the fast memory to go with it. No on-board graphics support on the 1155's hence the dedicated card. You can't overclock on an H67 board. And the P67 won't handle onboard graphics either. It does take a variety of CPU's at speed and has enough ports and slots to run for a while. You don't need a flash gaming graphics card for photo-video, just one with a good cache and memry - 512Mb minimum or preferably 1Gb. Through-put is more important than 3-D game rendering. Yes, there are now (expensive) 3-D game cards with massive GPU's (Graphics Processors) but hardly any software optimised to use them yet. Far better to get a workhorse and throw memory at it, hence the video card and the 8Gb of system memory. It does need a 64-bit OS or a 32-bit extender to address that much memory, however. The simple 1Tb hard drive is a good value performer. I notice that 2Tb drives are getting cheaper and more common, along with the 1.5Tb's. I've not specified a case as there are many shapes, sizes and designs - most of them ugly. The silver-fad has gone to be replaced by the New Black Fad in, err, black. With LED's, illuminated cutouts and glowing fibre-optics. The micro-cases are micro-scopic (CPU cooling alert!) and the gaming cases are the size of the black slab in 2001: A Space Odessey. I'd have to extend the house to have somewhere to put one.